Former football star O.J. 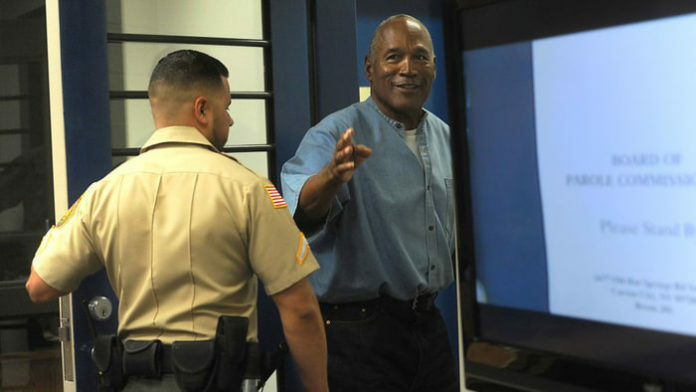 Simpson was released from a Nevada prison early Sunday after serving nine years in prison for a 2007 armed robbery and kidnapping in Las Vegas. The onetime football legend whose earlier murder trial in Los Angeles inspired years of debate over race and justice was paroled only minutes after he first became eligible for release, a Nevada prison official confirmed. Simpson left the Lovelock Correctional Center northeast of Reno at 12:08 a.m. in the company of an unidentified driver, said Brooke Keast, a spokeswoman for the Nevada Department of Corrections. “He is out,” Keast said. She said prison officials had sought to conduct the release quietly, with as little public and media attention as possible. Keast said she had no information on Simpson’s intended destination. “I do not know where he’s going. I didn’t want to know, to be honest,” she said. Simpson’s attorney, Malcolm LaVergne, interviewed before his client’s release, did not reveal any plans, but said Simpson was “excited” to be leaving prison. “I can tell from his voice on the phone last night that he’s looking forward to freedom and hugging his family on the outside,” LaVergne said.